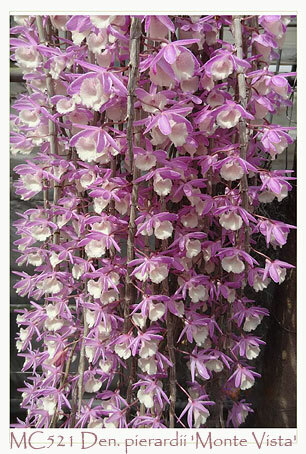 Endemic to Southeast Asia, this beautiful and violet-fragranced intermediate-growing species is often found growing in evergreen lowland forests. A deciduous species, its pendulous canes are best grown mounted to allow a drier winter rest which will then encourage early spring flowering. With the onset of new growth in late winter, resume normal watering and fertilizing. 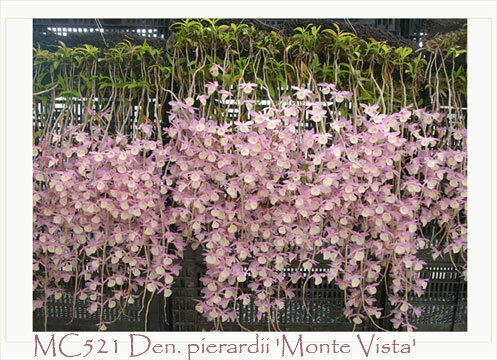 Its charming pastel pink flowers, adorned with a fuzzy creamy-white lip, are produced in the spring at the nodes of its leafless canes with 1-3 flowers on each inflorescence. These are well-established 18”+ long plants, currently in spike. 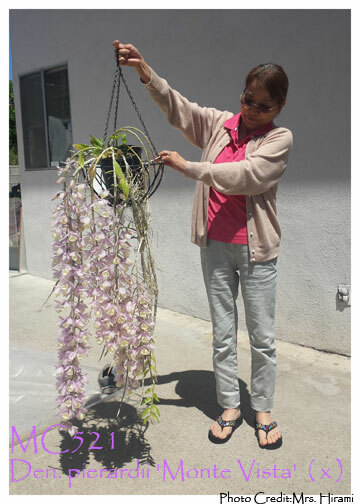 Our client, Mrs. Hirami (pictured in the 3rd photo), purchased this clone 6 years ago from us and has been growing it outdoors in southern California with her Cymbidiums. It has received lots of light, watering and fertilizing from spring to fall. Highly Recommended !